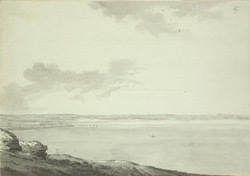 A view in ink of Weymouth Bay in Dorset. This sheltered bay was extremely popular at the time Grimm made this drawing. George III visited regularly and purchased Gloucester Lodge (built by his brother) on the seafront.